PUEBLO - The Colorado State University-Pueblo Foundation recently hired CSU-Pueblo alumna Stephanie Johnson as the organization's administrative assistant. Johnson will perform administrative and office support activities and will create daily reports of gifts and donations made to the CSU-Pueblo Foundation. She will coordinate CSU-Pueblo Foundation Board meetings and will be involved with promoting and assisting with Foundation fundraising and special events. A 2014 CSU-Pueblo graduate, Johnson received a Bachelor of Science degree in psychology with a minor in biology and was inducted to the Psi Chi honor society. While attending CSU-Pueblo, Johnson worked in multiple positions on campus as a student. After graduation, she was a contract employee in the CSU-Pueblo Registrar's Office and Student Financial Aid. "We are excited to have Stephanie join our team," said Todd Kelly, CSU-Pueblo Foundation President/CEO. "Being able to employ a CSU-Pueblo graduate is great, and Stephanie has plenty of experience working in various University departments as well as gaining customer relations experience with her time at Starbucks. 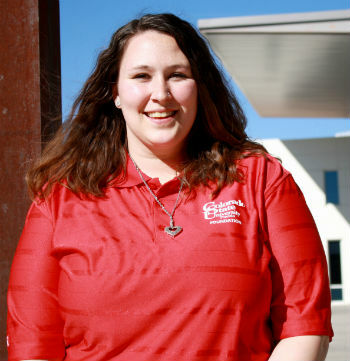 She is going to be a great addition to the CSU-Pueblo Foundation." Committed to the community, Johnson's employment with the Starbucks franchise paved the way for her involvement in the community, particularly with the clean up of community parks and maintenance of trails between Pueblo, Colorado Springs, and Denver. As a recent CSU-Pueblo graduate, Johnson is excited to work closely with current University students and apply the skills and knowledge she obtained while attending CSU-Pueblo to her position in the Foundation. For more information, contact CSU-Pueblo Foundation Marketing and Stewardship Specialist Sammi Mutz at 719.549.2469 or sammi.mutz@csupueblo.edu.